The Ekornes Elevator Ring is designed exclusively for Stressless recliners and adds almost 1.33 inches to the height of your Ekornes chair. No parts or tools are needed for installation. 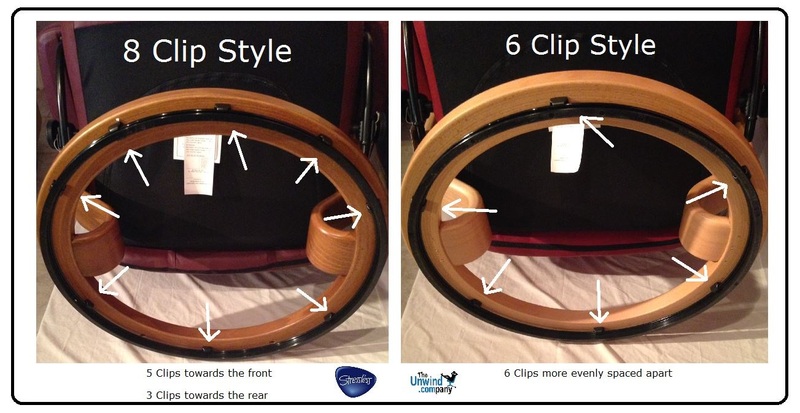 You simply slide your Stressless recliner right on top of the ring and will "lock" into place. Many of our older customers (or folks with bad knees) find that adding 1 or 2 Ekornes Elevator Rings makes it much easier to get out of the chair, by eliminating some of the natural stress that occurs to the knees when lifting yourself from a sitting position. *Please note that this elevator ring will not attach to the Stressless Jazz or Stressless Blues recliners. They use special "Height Increase Stems" that can be inserted into the base stem. There are 3 sizes of Elevator Rings for Stressless recliners. These are primarily for those purchased after 2012. For those purchased prior to 2012, please call 1-888-486-9463 so we can match you with the correct size (older models used to come in 2 sizes, rather than 3) for your Stressless recliner. Originally, the Small and Medium Sized Model Recliners fit onto wooden bases that had the same diameter circle underneath. This means Elevator Rings for Small/Medium Chairs Pre-2011 were the same width. Please confirm the clip count when adding this item to your basket. How do you know which size you need? First, determine which size your recliner/chair is and you can do that most times by knowing the model name: e.g. Diplomat Recliner (e.g. Consul small) and Ottoman means you have a small sized model. You should also select either 8 Clip or 6 Clip style before adding this item to your cart. Allow us to explain: In November of 2011, Ekornes announced that they would be revising their design of the wooden bases. In their changes, the actual diameter of the circular part of the wooden 2-Stem Bases, increased. The Post-2011 Styled Bases are a slightly different size and thus require a slightly different size Elevator Ring. The 3 different sizes of elevator rings are for Stressless recliners purchased after 2012. For those purchased prior, please call 1-888-486-9463 so we can match you with the correct size (older models come in 2 sizes, rather than 3) for your Stressless recliner. Come visit The Unwind Company store to demo the Ekornes Stressless Elevator ring for yourself. If you have already decided and are ready to purchase, simply order here securely. We will ship your Ekornes Elevator ring quickly and safely worldwide. Please review our return policy prior to ordering or call 888-486-9463 for personal assistance. You may also email stressless@Unwind.com anytime- 24 hours - 7 days a week. At first my chair felt too low...as though I was viewing the world around me as a kid in grammar school. When I learned about an elevator ring, I jumped at it. Now I am a grown-up in my very comfortable chair. As described - can't ask for more. Ordered online and immediately received a call from a representative that confirmed exactly what and how to order. Item arrived quickly and fits perfectly.